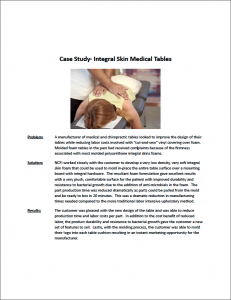 A manufacturer of medical and chiropractic tables looked to improve the design of their tables while reducing labor costs involved with “cut-and-sew” vinyl covering over foam. Molded foam tables in the past had received complaints because of the firmness associated with most molded polyurethane integral skins foams. Using NCFI’s very soft, low density Integral Skin Foam, the customer was very pleased with the result!